Customer pays a deposit of 50 (%) percent of the purchase price plus 100% of the taxes. An additional 2% transaction fee will be added if the deposit is made by PayPal, credit card or debit card. (see acceptable forms of payment below). The remainder 50% (cash only) balance is due when puppy is picked up to be re-homed. 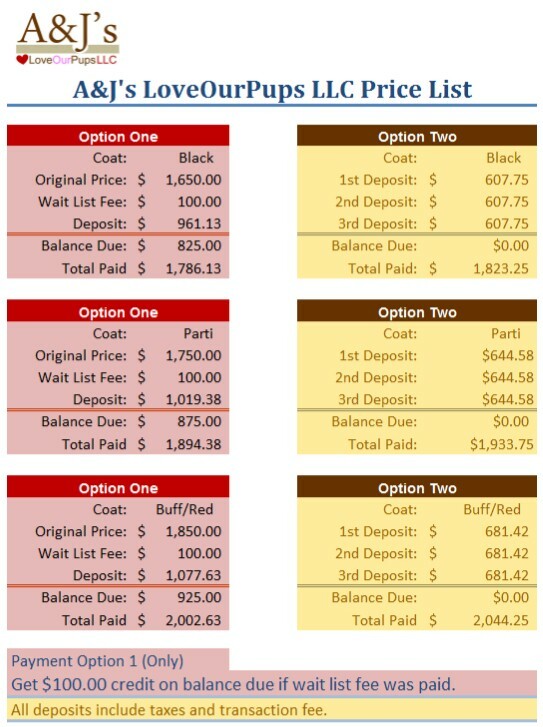 If a customer paid the waiting list fee of $100.00, they will receive a credit on their final payment (this only applies to our perefered option one selection). We do not accept personal checks. Acceptable forms of payment are - PayPal, Credit Card, Debit, Card (transaction charge will be added), Western Union, Money Gram, Cashier’s Check or Money Order in overnight delivery to us. ALL PRICES HAVE SALES TAX ALREADY INCLUDED. Our prices may vary and are usually set at the time a litter is born. Prices for first our generation already included sales tax and transaction fees. A required deposit can be up to 50% of the purchase price and will be listed below as one of the PayPal payment options. (Making a payment using PayPal is not the only method. However due to our first come first serve policy, it is the fastest means to securing a pick of a current litter.) Included in our sales price is our re-homing and starter package, which includes a puppy, current vaccinations and ACC registration. Payment Options: We do not accept personal checks. 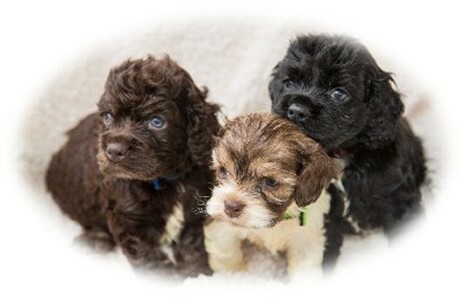 Acceptable forms of payment for cockapoo puppies are PayPal, credit card, debit card (transaction charge will be added), Western Union, MoneyGram, cashier's check, or money order in overnight delivery to us. Since most regular mail can be slow, it is recommended to send a reservation deposit via Priority Mail or UPS. As a respected, licensed dog breeder in Georgia, we take it seriously when buyers reserve puppies with us. All other interested parties will be turned away from the buyer’s reserved puppy.